Borderlinx | Buy Dune and ship worldwide with Borderlinx. Cheap rates guaranteed. The search for fine trusted, proven footwear is over thanks to Dune UK. For more than 20 years, Dune UK has been amazing customers with its fine craftsmanship in footwear for men and women. Offering shoes, boots, heels, sandals and more. Dune UK products are sure to accent any outfit, whether for a night on-the-town or for business attire. Dune UK keeps up with the latest fashion-forward trends in footwear, as well as adhering to tried-and-true classic styles in order to bring you the perfect look every single time. Dune UK styles are a bold way to finish off any outfit and are listed alongside many accessories such as jewelry, sunglasses, hats, scarves and more. From professional, to classic, to modern edgy looks, customers can feel confident knowing that every pair of footwear is made with the same commitment to quality and durability. Some Dune UK items are available for under $100 and regular sales promise even more savings for your pocketbook. Alongside its trusted brand, Dune UK additionally lists other fine brands such as Lacoste, Steve Madden, Timberland, Polo Ralph Lauren and many more. New collections are regularly added to the Dune UK footwear selection, such as formal bridal and groom collections. 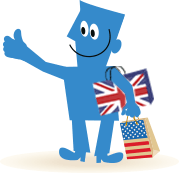 Customers across the globe can now buy Dune in the UK with Borderlinx! Using our shipping cost calculator to determine cheap shipping, tax & duties upfront, as well as services such as concierge, free repacking and consolidation, Borderlinx makes international ordering from Dune UK simple and hassle-free!